Alfred Thurston Mills rates his own page here because he was headteacher at Eversholt School. They were living in a 10-room house in Church End – presumably, School House. How long did he stay in Eversholt? Is there a picture of him in the school photos? We don’t know. The 1901 census shows him a schoolmaster aged 22 in Ealing. There’s a record of his death here. He died aged 63 on 19 November 1941 and we’re told that his epitaph is “Son of William Thurston Mills and Rosa Mills; husband of Alice Maud Mills, of Hitchin. Headmaster. Remembered with honour”, with a gravestone in Hitchin Cemetery. He was serving as a private in the Home Guard when he died. Joyce’s Postcard tells us more about Alfred and the family! The Mills family were still living in Eversholt in 1921, so we almost certainly do have photos of Alfred and Beryl Joyce Mills. David Kerrison is Alfred Thurston Mills’s great-grandson! He contacted us after finding the story of Joyce’s Postcard. Joyce was his grandmother. 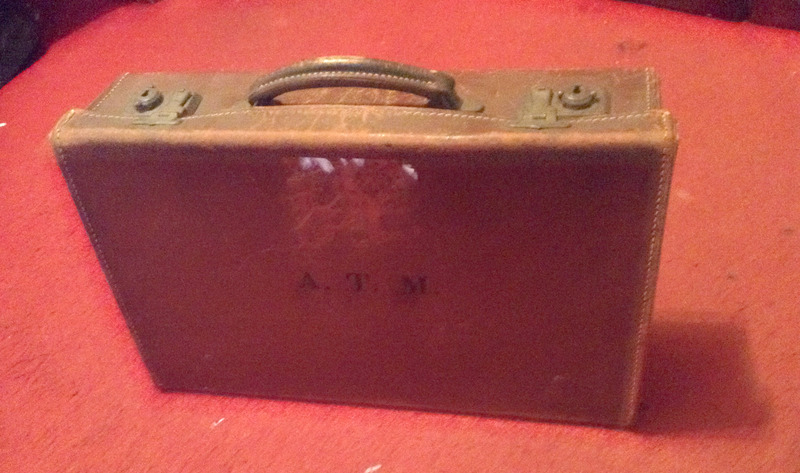 He kindly sent us this photo of Alfred Thurston Mills’s briefcase, which he must have used while he was headteacher at Eversholt school. Thank you very much, David! Click the photo for a larger version. David would very much like to know when Alfred Thurston mills left Eversholt. Does anyone know? Please leave a comment!